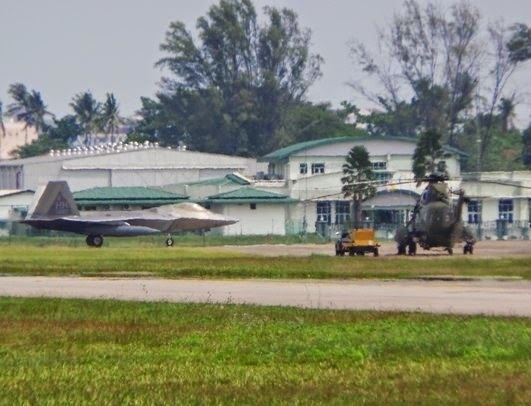 Cutting edge: A United States Air Force F-22A Raptor taxis past a Royal Malaysian Air Force S61A-4 Nuri helicopter at TUDM Butterworth on 6 June 2014 and is later ringed by ground crew. Photos courtesy of Dzirhan Mahadzir. Starting tomorrow (9 June 2014), United States Air Force (USAF) Lockheed F-22A Raptors - the world's most advanced fighter jet - will join Royal Malaysian Air Force (RMAF) warplanes and helicopters for the most complex US-Malaysia air warfare manoeuvres held in the Federation to date. Codenamed Cope Taufan 2014, the bilateral exercise marks several milestones in US-MY defence relations. Taufan is the Malay word for Typhoon. First, the deployment of six F-22As makes the RMAF the first air force in ASEAN to host the Raptor for war games held in regional airspace. The learning value for the RMAF is noteworthy. The commitment of all fighter types by the RMAF indicates that Malaysia recognises this point and wants to maximise opportunities for its pilots to fly with and against advanced fighters such as the F-22 Raptor and F-15 Eagle. From the US point of view, American military aviators will probably relish the opportunity to fly with advanced Russian fighters such as the MiG-29 and Su-30 as the air combat serials represent the ultimate in dissimilar air combat training. Second, Cope Taufan will see the United States military deploy its Joint Deployable Electronic Warfare Range (JDEWR) to Malaysia for the first time. This training aid should add value to the Angkatan Tentera Malaysia (Malaysian Armed Forces) as it will allow Malaysian warfighters to understand and appreciate how air combat tactics should be executed in contested airspace. Nurtured judiciously, this is expected to engender a shift in Malaysian mindsets from a platform-centric view of warfare to a network-enabled one involving integrated platforms working with one another. When they eventually see the light, it will mark a paradigm shift in the way they do business. Third, the quantity and quality of American air assets now in Malaysia signals that the US is hedging its bets when it comes to regional engagement. 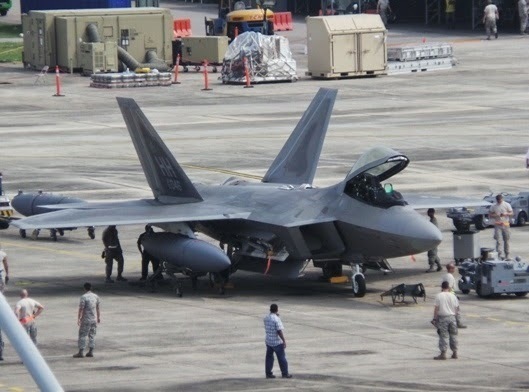 Senang Diri understands that plans to fly F-22s to Malaysia were hatched at least six months ago - which is round about the time Singapore gave extensive publicity to its integrated live-fire exercise, codenamed Forging Saber, held in the United States. This point shows that the US has alternatives in anchoring its military presence in Southeast Asia and is prepared to look beyond, and work with, partners other than Singapore. Oftentimes, we tend to overrate our importance in grand strategy of major powers. Last, the commencement of the war games - the largest and most staged between the two air forces - demonstrates the high exercise tempo of the RMAF's war games calendar. Cope Taufan comes close on the heels of the RMAF's recent involvement in the Five Power Defence Arrangements war games, Bersama Shield, which saw it send Hawk 200 fighter jets to Singapore as part of the fighter land-away arrangement. Eksesais Cope Taufan 2014 will see assets fly from 9 to 20 June from TUDM Butterworth, TUDM Kuantan and TUDM Subang near the Malaysian capital Kuala Lumpur. These air bases will offer the Cope Taufan exercise directorate flexibility in employing air assets as missions can be staged over the Andaman Sea to the west or eastward over the South China Sea. The F-22s flew into TUDM Butterworth on 6 June (the historically aware will recognise the date as the anniversary of the Overlord landings in Normandy), with the moment captured by Malaysian defence journalists (see images above from Dzirhan Mahadzir). A statement from the US Pacific Air Forces said:"Cope Taufan is an excellent opportunity to improve combined readiness and cooperation between the U.S. and Malaysia. This large force employment exercise will include operations in air superiority, close air support, interdiction, tactical airlift, and combat search and rescue." US PACAF added that the war games will allow for "an exchange of techniques and procedures to enhance cooperation between U.S. and Malaysian Airmen". "It also provides a quality training venue for U.S. and Malaysian aircrew and maintenance personnel," it added. "Pacific Air Forces has conducted exercises with the Royal Malaysian Air Force since the early 1980s. By participating in exercises with military forces from partner nations in the Asia-Pacific, the U.S. demonstrates its commitment to peace and stability in the region." What value is there in the most sophisticated and cutting-edge technology and weapon system is the people manning them are not up to scratch? Equally noteworthy is the fact that the RMAF allow UFOs and planes without flight plans to fly through their airspace. The top guns and most awesome planes in the world sitting on the tarmac (or hidden in some bunkers) are no use if the radar operators are kooning on the job. Then why do you need to spend money to get the F15s and Leopards?